The pressure altimeter is simply an aneroid barometer that measures the pressure of the atmosphere at the level where the altimeter is located, and presents an altitude indication in feet. 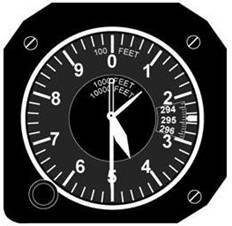 The altimeter uses static pressure as its source of operation. Air is more dense at the surface of the Earth than aloft, therefore as altitude increases, atmospheric pressure decreases. This difference in pressure at various levels causes the altimeter to indicate changes in altitude. The dial of a typical altimeter is graduated with numerals arranged clockwise from 0 to 9 inclusive. The shortest hand indicates altitude in tens of thousands of feet; the intermediate hand in thousands of feet; and the longest hand in hundreds of feet, subdivided into 20-foot increments. The vertical distance of an aircraft above the terrain. That altitude read directly from the altimeter (uncorrected) after it is set to the current altimeter setting. The altitude indicated when the altimeter setting window (barometric scale) is adjusted to 29.92. This is the standard datum plane, a theoretical plane where air pressure (corrected to 15° C) is equal to 29.92 in. Hg. Pressure altitude is used for computer solutions to determine density altitude, true altitude, true airspeed, etc. The true vertical distance of the aircraft above sea level—the actual altitude. (Often expressed in this manner; 10,900 feet MSL.) Airport, terrain, and obstacle elevations found on aeronautical charts are true altitudes. This altitude is pressure altitude corrected for nonstandard temperature variations. When conditions are standard, pressure altitude and density altitude are the same. Consequently, if the temperature is above standard, the density altitude will be higher than pressure altitude. If the temperature is below standard, the density altitude will be lower than pressure altitude. This is an important altitude because it is directly related to the aircraft’s takeoff and climb performance. The airspeed indicator is a sensitive, differential pressure gauge which measures and shows promptly the difference between (1) pitot, or impact pressure, and (2) static pressure, the undisturbed atmospheric pressure at level flight. These two pressures will be equal when the aircraft is parked on the ground in calm air. When the aircraft moves through the air, the pressure on the pitot line becomes greater than the pressure in the static lines. This difference in pressure is registered by the airspeed pointer on the face of the instrument, which is calibrated in miles per hour (MPH), knots, or both. Indicated airspeed (IAS) is the direct instrument reading obtained from the airspeed indicator, uncorrected for variations in atmospheric density, installation error, or instrument error. 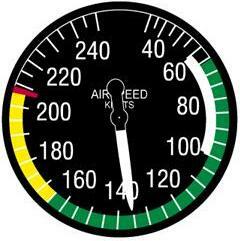 Calibrated airspeed (CAS) is indicated airspeed corrected for installation error and instrument error. The true airspeed indicator (TAS) is calibrated to indicate true airspeed under standard sea level conditions—that is, 29.92 in. Hg. and 15° C.
There are other important airspeed limitations not marked on the face of the airspeed indicator. These speeds are generally found on placards in view of the pilot and in the Airplane Flight Manual or Pilot’s Operating Handbook. the stalling speed or the minimum steady flight speed at which the airplane is controllable. the stalling speed or the minimum steady flight speed in the landing configuration. the stalling speed or the minimum steady flight speed obtained in a specified configuration. 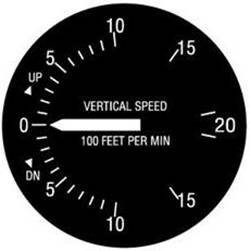 The vertical speed indicator (VSI) or vertical velocity indicator indicates whether the aircraft is climbing, descending, or in level flight. The rate of climb or descent is indicated in feet per minute. If properly calibrated, this indicator will register zero in level flight. In this system, the impact air pressure (air striking the airplane because of its forward motion) is taken from a pitot tube, which is mounted either on the leading edge of the wing or on the nose, and aligned to the relative wind. On certain aircraft, the pitot tube is located on the vertical stabilizer. These locations provide minimum disturbance or turbulence caused by the motion of the airplane through the air. The static pressure (pressure of the still air) is usually taken from the static line attached to a vent or vents mounted flush with the side of the fuselage. Airplanes using a flush-type static source, with two vents, have one vent on each side of the fuselage. This compensates for any possible variation in static pressure due to erratic changes in airplane attitude. The openings of both the pitot tube and the static vent should be checked during the preflight inspection to assure that they are free from obstructions. Clogged or partially clogged openings should be cleaned by a certificated mechanic. Blowing into these openings is not recommended because this could damage any of the three instruments. The magnetic compass, which is the only direction-seeking instrument in the airplane, is simple in construction. It contains two steel magnetized needles fastened to a float around which is mounted a compass card. The needles are parallel, with their north-seeking ends pointed in the same direction. The compass card has letters for cardinal headings, and each 30° interval is represented by a number, the last zero of which is omitted. For example, 30° would appear as a 3 and 300° would appear as 30. Between these numbers, the card is graduated for each 5°. The float assembly is housed in a bowl filled with acid-free white kerosene. The purposes of the liquid are to dampen out excessive oscillations of the compass card and relieve by buoyancy part of the weight of the float from the bearings. Jewel bearings are used to mount the float assembly on top of a pedestal. A line (called the lubber line) is mounted behind the glass of the instrument that can be used for a reference line when aligning the headings on the compass card. Although the magnetic field of the Earth lies roughly north and south, the Earth’s magnetic poles do not coincide with its geographic poles, which are used in the construction of aeronautical charts. Consequently, at most places on the Earth’s surface, the direction-sensitive steel needles which seek the Earth’s magnetic field will not point to True North but to Magnetic North. The angular difference between True North and the direction indicated by the magnetic compass—excluding deviation error—is variation. Variation is different for different points on the Earth’s surface and is shown on the aeronautical charts as broken lines connecting points of equal variation. These lines are isogonic lines. The line where the magnetic variation is zero is an agonic line. Actually, a compass is very rarely influenced solely by the Earth’s magnetic lines of force. Magnetic disturbances from magnetic fields produced by metals and electrical accessories in an aircraft disturb the compass needles and produce an additional error. 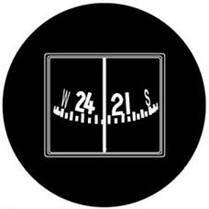 The difference between the direction indicated by a magnetic compass not installed in an airplane, and one installed in an airplane, is deviation. Although compensating magnets on the compass are adjusted to reduce this deviation on most headings, it is impossible to eliminate this error entirely on all headings. Therefore, a deviation card, installed in the cockpit in view of the pilot, enables the pilot to maintain the desired magnetic headings. Since the magnetic compass is the only direction-seeking instrument in most airplanes, the pilot must be able to turn the airplane to a magnetic compass heading and maintain this heading. It will help to remember the following characteristics of the magnetic compass which are caused by magnetic dip. These characteristics are only applicable in the Northern Hemisphere. In the Southern Hemisphere the opposite is true. If on a northerly heading and a turn is made toward east or west, the initial indication of the compass lags or indicates a turn in the opposite direction. This lag diminishes as the turn progresses toward east or west where there is no turn error. If on a southerly heading and a turn is made toward the east or west, the initial indication of the compass needle will indicate a greater amount of turn than is actually made. This lead also diminishes as the turn progresses toward east or west where there is no turn error. If a turn is made to a northerly heading from any direction, the compass indication when approaching north lags behind the turn. Therefore, the rollout of the turn is made before the desired heading is reached. If a turn is made to a southerly heading from any direction, the compass indication when approaching southerly headings leads behind the turn. Therefore, the rollout is made after the desired heading is passed. The amount of lead or lag is maximum on the north-south headings and depends upon the angle of bank used and geographic position of the airplane with regard to latitude. When on an east or west heading, no error is apparent while entering a turn to north or south; however, an increase in airspeed or acceleration will cause the compass to indicate a turn toward north; a decrease in airspeed or acceleration will cause the compass to indicate a turn toward south. If on a north or south heading, no error will be apparent because of acceleration or deceleration. The magnetic compass should be read only when the aircraft is flying straight and level at a constant speed. This will help reduce errors to a minimum. If the pilot thoroughly understands the errors and characteristics of the magnetic compass, this instrument can become the most reliable means of determining headings.